The nations are anything but united as the UN moves its headquarters to the world's largest ship. While a group of terrorists begin to murder freely about the ship, international relations begin to breakdown. 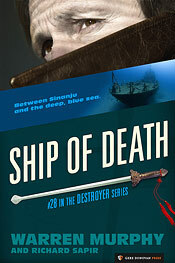 With Remo and Chiun no longer working for CURE, Smitty is on his own to get to the bottom of it while a rivalry between two Greek shipping magnates fuel the body count. Will the Destroyer repair his allegiance in time to keep the UN from going down with the ship?